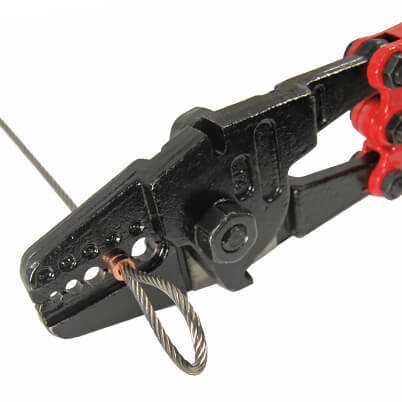 Multi-functional budget tool for swaging copper and aluminium ferrules on to wire rope, with cutting blades on the sides of the jaw for trimming steel wire rope up to 6mm diameter. Simple leverage operation for quick and easy swaging of ferrules and end stops. Swage size: 1.5mm up to 5mm. Blades dropped forged with high quality alloy steel. 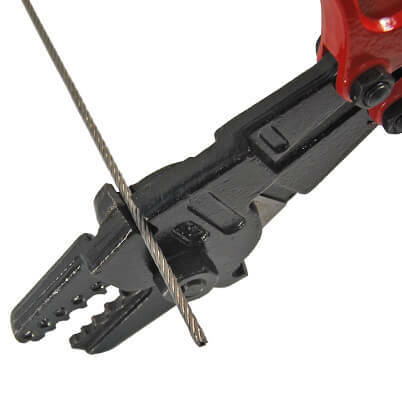 Cuts wire rope up to 6mm diameter. Portable swaging tool with an overall length of 24" (609mm). DO NOT USE For lifting, critical or safety applications unless the assembly has been fully tested. Please be careful when using this tool as there are many different systems of crimps and ferrules on the market. The numbers on the jaws of the tool do not strictly relate to wire diameter. For example a thicker walled ferrule designed for 3mm wire may be better crimped in the hole marked "2". Top quality! I'll never need to replace this tool! Great value, especially for the DIY'er. Simple to use. Easy to store.